We talk to Maxime Ruphy on the all-important mechanics of Haute Route racing. 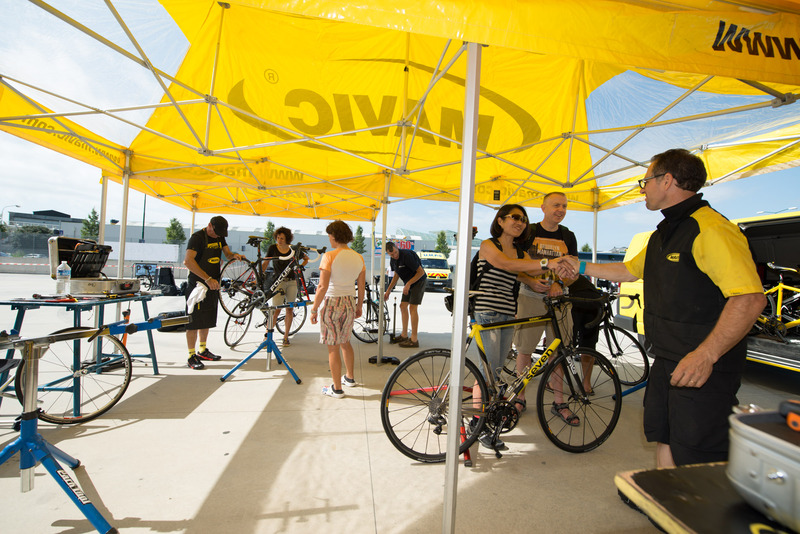 Once again the expert mechanics from top cycling wheel and accessories supplier, Mavic, will be in attendance at all of the Haute Route events this year. The company will have a truck and service tent at all of the race start and finish villages and three of their bright yellow cars will be on the road every day with the riders, helping to solve mechanical issues. One of the five Mavic mechanics in attendance this year will be the French former Cat 1 racer and ace bike fixer, Maxime Ruphy, who worked for the company at both the Haute Route Alps and the Pyrenees events last year. We checked in with Ruphy for a few tips on mechanics and bike maintenance when it comes to racing hard in the mountains for a week. His main thought is a simple one: “get your bike properly serviced before you arrive at the start.” Sounds pretty obvious but last year Ruphy was surprised to find that some riders turned up with their bikes in no fit state for the challenge that lay ahead of them. So anything that looks like it might need replacing should be replaced before you travel to Anglet, Nice or Geneva. Ruphy is pretty low-key on mega bikes. “The best thing,” he says, “is to use a bike that you already know inside out. Don’t try to use a new bike that you have only just started to ride. You need to feel good on your bike; it could be a very expensive model but also a low priced one. If you are good on this bike, you can feel good on the road.” So spending a fortune is not always the answer to success in the Haute Route. On the subject of wheels, no surprise that Ruphy recommended his own company’s products. He added, however, that he does not recommend people use tubular tyres unless they are fully conversant with changing them. Last years several riders who used tubulars ended up having to wait for the Mavic car for help on replacing them, losing them critical time on the stage. Ruphy will be present at the Haute Route Alps and Dolomites Swiss Alps this year, having previously been in attendance at many Spring Classics and the Tour de France and other professional races. The Haute Route makes a nice change for him and his colleagues because the Mavic team is there to take care of everything on the bike, not just wheels as they do at most professional events.